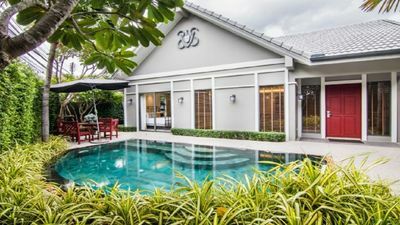 Anjali Villa is an elegant and stylish home that delivers bright living spaces incorporating modern facilities within a tropical & traditional Thai house. The stunning fully serviced 220 Sq / m offers sleeps up to 9 guests with three spacious bedrooms. 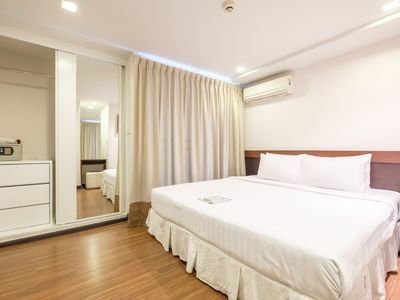 Extra king size bed & single bed are available. 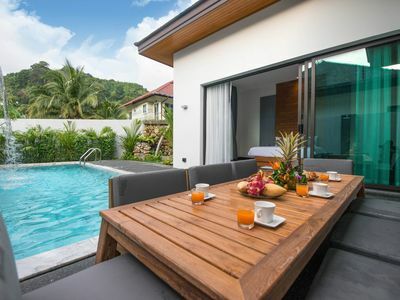 Anjali Villa is located in Jomtien Beach, Pattaya, and is within walking distance of Jomtien Beach. 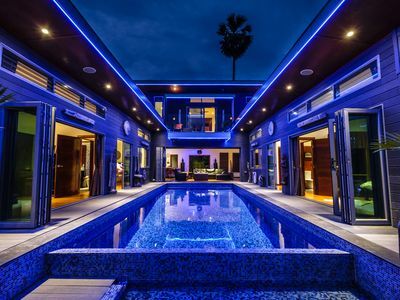 The house has been designed by me and my husband as descret and private location. 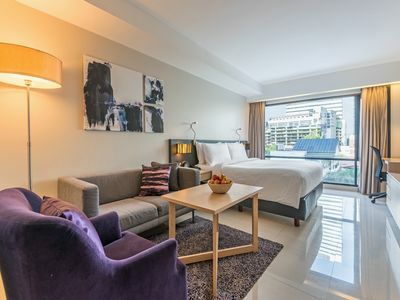 At ground floor large and lovely decorated open living and lounge area with antique furnitures, flatscreen smart internet TV, sitting area where you can relax after a long day out. Big ceiling fans provide natural freshness. 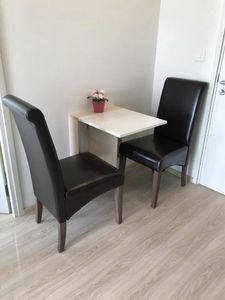 Double dining area for your romantic dinner and fully Euro equipped kitchen are available. It also has an electric hob for having a nice barbeque in the patio. Massive bathroom with basin, double jacuzzi and shower. 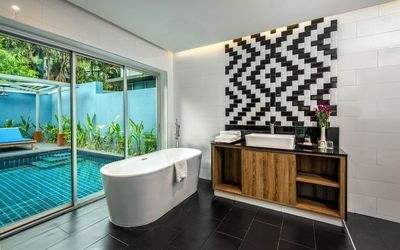 Second comfortable bathroom with modern toilet, basin and shower. Small laundry area arranged with washing machine, ironing board and sink. Third outdoor shower is located in the patio / garden to enjoy a nice cool water in the tropical atmophere. The small garden is also provided with light and decoration too. 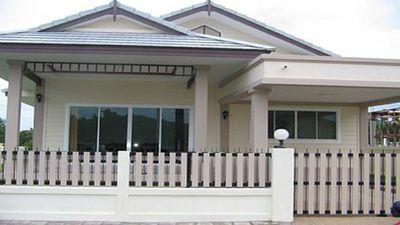 First floor with master bedroom and spacious king size bed, work desk, flat screen TV, music facilities and nice veranda. 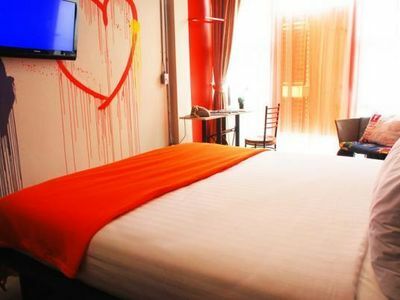 Second deluxe queen size bed, desk, huge wall cupboards and wardrobe and flat screen TV. Third deluxe queen size bed and shelves. 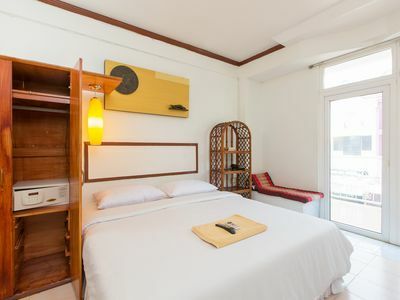 All bedrooms are elegantly decorated with teak wood carving screens to provide extra touch of traditional Thai style and all the first floor features wood parquet. 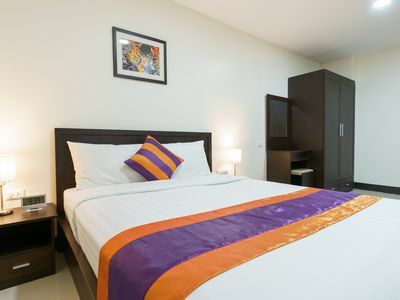 Rooms and office are provided with aircon and fans. Stylish bathroom with modern toilet, basin, walk-in large shower, hair dryer. The service includes Electric, Water, WiFi & TV, towels, bed linen. There is no extra charge. Self checkin is available to provide guests with anytime access to the house. 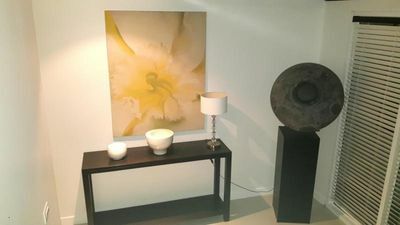 The guests will have access to the entire house minus a storage room where I collected some personal stuff. 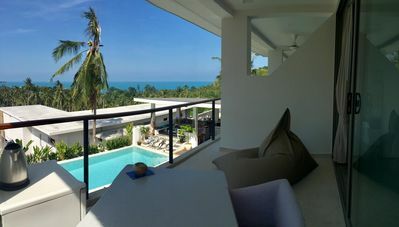 The location of the Anjali Villa is far from the noise and bustle that is Pattaya - this made a welcome change when we arrived back from sightseeing. 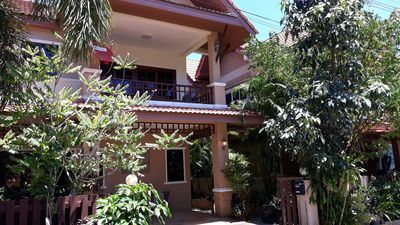 The Anjali Villa is located in a very quiet residential neighborhood and there are several nice restaurants and cafes all close by if you prefer eating out but not traveling to downtown Pattaya. There is almost every corner in Pattaya, you will find taxi motorbikes. If you are a large group or prefer to go by car, you can also ask them to contact a "baht bus", which is a pickup truck, with seats in the back. You will also see these trucks driving in the city. Both services are available 24/7, so its always easy to get around. 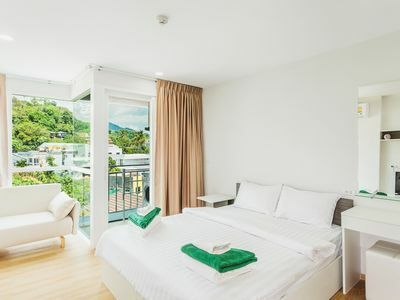 The Anjali Villa is conveniently located next to ATMs, money changers, restaurants including Italian Pizza, the traditional Thai, Korean and English pubs and Pattaya's finest restaurants (Cafe des Amis, Bruno's, Mata Hari, Gian's etc). There are also many coffee shops (La Baguette), bars, shops, Thai massage shops, beauty clinics, tour shops and gyms. 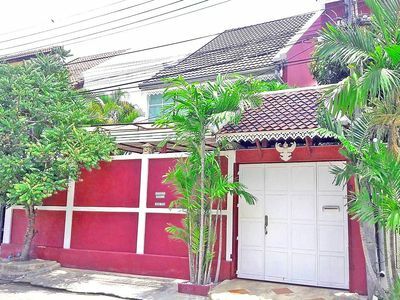 The villa is 5/8 mins taxi or motorbike taxi or Songtaew Thai taxi to Jomtien Beach or Cozy Beach in Pratamnak Hill. Central Pattaya beach and Koh Larn boat pier are at 10mins. 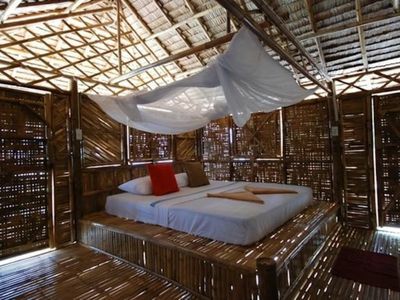 Bali Hai, the boats to Koh Larn's sandy and white beaches and other Pattaya Islands are at 10mins taxi or motorbikes. Walking Street, Beach Road and Central Mall are at 8mins by motobikes or taxi. Foodmark store open 24/7 providing all stuff you may need is less than 5mins motorbike ride. 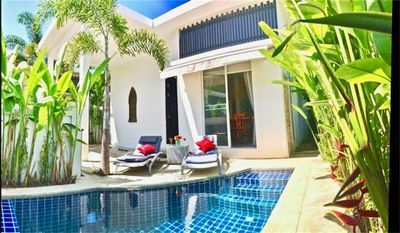 Anjali Villa is located at 2mins walk form Rama Kien resort. 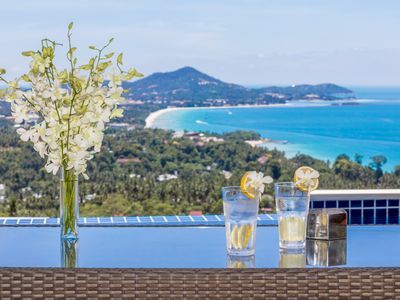 Pattaya has emerged as one of Asia's best golf destinations with over 20 of South-East Asia's finest golf courses, located in tropical evergreen landscapes, most of which are within a short drive of the Anjali Villa with world-class facilities. 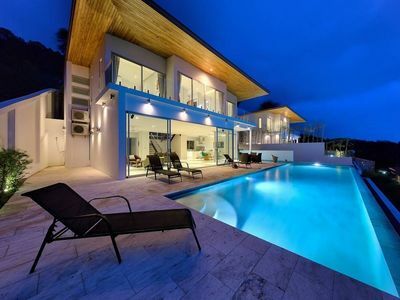 Asia Pattaya Golf Course is only 1km from the villa.